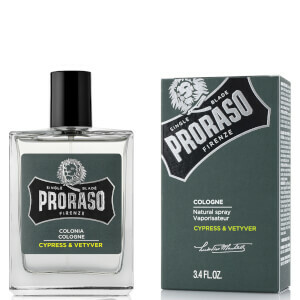 The Cypress and Vetyver Cologne is the one of the first colognes from the iconic, Italian-based grooming brand, Proraso. Developed as the finishing touch to the perfect shave, the fragrance opens with invigorating citrus accords of Bergamot that merge with earthy tones of Cypress and Vetivier. Settling upon a familiar base of Cedarwood, it forms a classic masculine scent that lasts. Housed in a sleek glass bottle.